Eric holding up a nice fat red spring from a trip on Monday! We were on the water a lot this past week and spent some time over in the Gulf Islands, in Vancouver Harbour, and in Howe Sound. 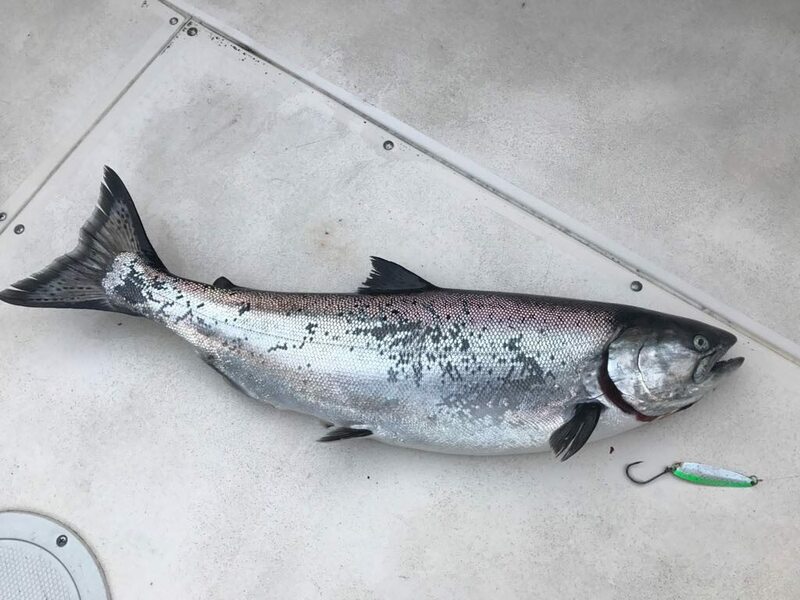 We picked up some nice chinook in all locations and lots of smaller fish as well. As usual, keeping your gear close to the bottom is the way to go this time of year, although I am starting to see some suspended bait balls and chinook signals, so I don’t think it will be too long before we start picking up a few fish mid water column in some spots. So far the fish have been on herring, so we will have to wait and see if the anchovies show up again this spring and we can have that shallow water fishery that we enjoyed the past few years. For now though, I would suggest 2 rods close to the bottom. Glow flashers and glow spoons have been doing well. The black glow flasher with moon jelly on one side has been good to me lately, it is called a CB55 and that paired with a Kingfisher 3.0 or 3.5 Herring Aide spoon has been a top producing setup. Of course you have to have down a chartreuse glow flasher like a Salty Dawg and 3.0 or 3.5 Irish Cream, as this setup is also very productive. This chinook fell for my 3.0 Irish Cream which if you look close can see is very well used with lots of teeth mark. Prawning has been decent and so has crabbing, so we have been dropping traps on most of our trips. We are looking forward to the days getting a big longer now as well. This will give us just a bit more time to drop traps and keep the lines wet a touch longer. 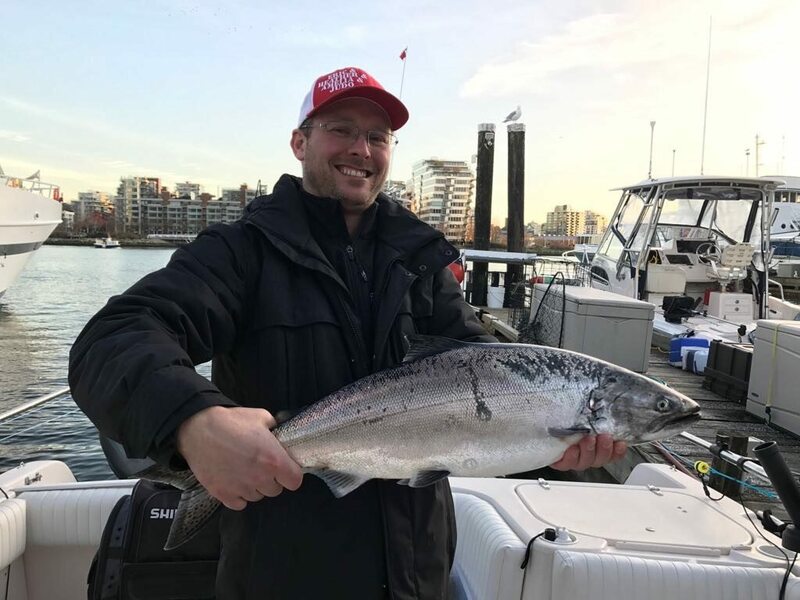 If you have taken our Mastering Saltwater Salmon Course, we are having a VIP event for past students this Thursday evening, so if you missed that email, make sure you contact Kathryn Sharp via email (kathryn@pacificangler.ca) or phone at the shop 604.872.2204.